This past weekend my site stats were exploding thanks to a scoop post from soundtrack guru Christopher Coleman. I had ten times the visitors I normally register which was a blast! Chris is spreading the signal himself with his ongoing podcast called “The SoundCast“. As a regular listener I highly recommend the show which features reviews and discussions centered around film, TV, and video game soundtracks. Boosted by this surprise, I was highly motivated to start my next work. And boy, this baby got going! 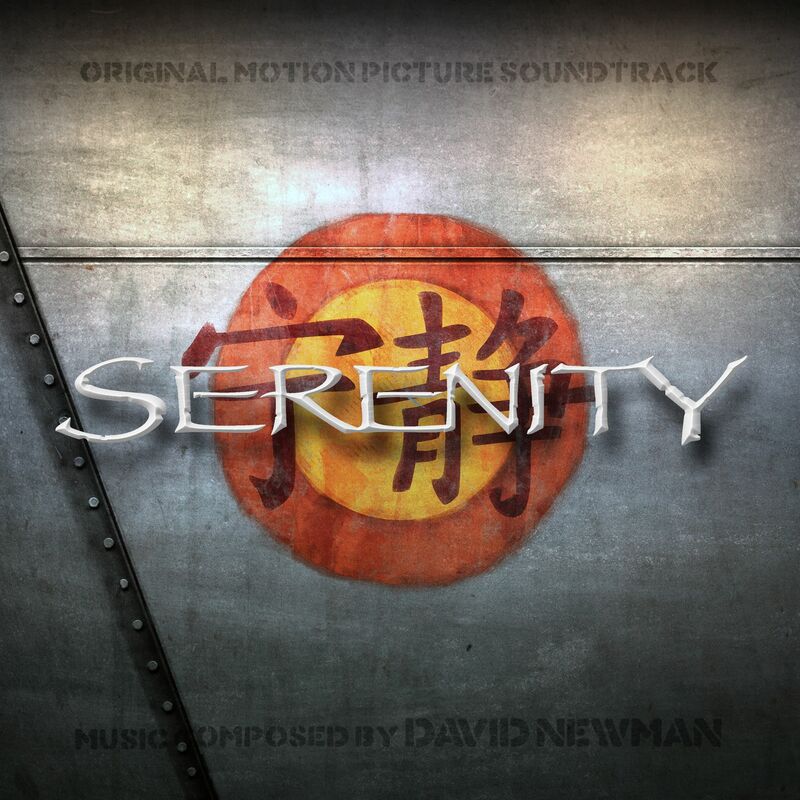 David Newman’s Serenity has sparked a true firework of creativity. I am a self-confessed “Browncoat” myself and still believe in some sort of sequel… one day. Therefore I wanted to deliver the best possible work. In my opinion the original cover artwork (#1) has a charming feel of the 90ies with its cramped design up to the last corner. And floating above it all those cheesy, menacing keywords. I’m usually a fan of minimalism, but in combination with the wonderful chemistry between the film characters and their witty humor it somehow fits perfectly. Serenity became a cult hit on the retail market and has been published over the years in several different editions. For my custom covers I’ve used some of these artworks as a basis (#2, #3, #7, #9). I tried to stay as varied as possible and drew inspiration from different sources. For example, as I was working on cover #3 I never was completely happy with it. My first draft was just the basic image with album credits below, but it felt a little blank. As always when I’m kinda stuck with some certain custom cover, I switch to another soundtrack and keep myself busy. This time it was I Am Legend that brought me back on track. I borrowed the idea to feature the lyrics of the Firefly theme song “The Ballad of Serenity” in the background. It blended in nicely with the film’s title as part of the lyrics and also bridges the gap between the film and its preceding TV show. So it not only has artistic purpose, but it also makes sense in context. Another thing I like to do, is to make the text elements part of the artwork’s environment. For cover #6 I wanted the album credits to appear as if they were painted on the ship’s hull. I had to try out several font types before I found the right one. The floating film title above the logo on the other hand gives the artwork depth and makes it clear that this is not supposed to be a snapshot per se. As you probably can see from my WordPress avatar, I love the movie logo, or rather that of its eponymous spaceship. I consider it as iconic as the logo of Jurassic Park. I found two very nice renditions on Google (#4, #5) and differed them both basically only by the album credits font types. In the first one I worked in the production studio logo, a thing I’d like to do from time to time (#4, #8). For the second one I rather used the font type you find on the official soundtrack cover (#1). I generally played a lot this time with different font types for the album credits. I don’t always use the term “Original Motion Picture Soundtrack” because sometimes it just doesn’t sit tight with the rest of the design. However, what I completely renounce in my covers is the word “Complete”, because – as stated before – it always makes me think of poor quality bootlegs. In addition below you’ll find the official soundtrack cover for Done the Impossible (#10), a 2006 documentary fan film whose focus is on the fans themselves, and how they came to love the show and, ultimately, played a part in getting the film Serenity made. It’s a scan of my own physical copy, because I couldn’t find a proper one in the whole frigging Cortex (www). If you haven’t seen this doc, go out and buy it. Maybe afterwards you’ll understand why this show is still beloved by so many. And why Serenity is still flying.